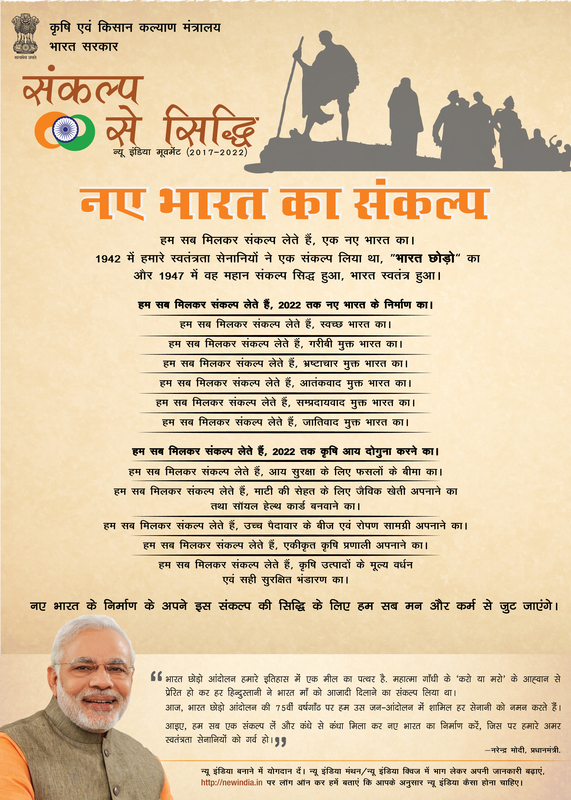 "New India Manthan - Sankalp Se Siddhi"
Objective: To aware about the programme of Govt. of India i.e "New India Manthan - Sankalp Se Siddhi"
"New India Manthan - Sankalp Se Siddhi" programme organized on 19th August, 2017 at KVK-Chomu (Jaipur). In this programme, more than 100 farmers, farm women and rural youths were participated. In this programme, Dr. S. S. Rathore, Sr. Scientist and Head, KVK-Chomu started with Welcome Address to farmers, farm women and rural youths as well as guests and took oath with all the participants as directed by the Govt. of India about the programme. KVK scientists briefly discussed with the farmers on doubling of income specially importance of soil health cards, hi-tech horticulture, post harvest management in vegetable, importance of drip irrigation, e-marketing system, weed and nutrition management in crops, dairy management, use of azolla and napier bajra as a fodder etc. The whole programme recorded by Jaipur Doordarshan Team for telecasting. Farmers also visited the demonstrations units established at KVK Farm.